Where are you from? Your profession? I am from the Northeast. Massachusetts and Southern New Hampshire. I was an Ob-Gyn for 38 years. The last eight years of my career were spent working for the Choctaw Nation Indian Healthcare System as Director of their Women's Health Center in Talihina, Oklahoma, way too far from the ocean! I have been retired for three wonderful years and my wife Ellen and I are living on Skidaway Island, Savannah, Georgia. When and how did you become interested in paddling? I had done some paddling in Maine and on Lake George, New York in the past but because of work obligations never really took it seriously. Now that I am retired and living on a barrier island off the coast of Georgia I had no excuses! I am on my third kayak in one and one half years. I have taken basic and advanced paddling classes with Savannah Canoe and Kayak. No Eskimo roll yet, but I am getting really close! Where is your favorite place to paddle? My favorite place to paddle is in Wassaw Sound off the coast of Georgia. There are many day trip options there ranging from six miles r/t to Raccoon Key to 13 miles r/t to Ossabaw Island. What’s the most interesting thing that ever happened to you on a paddling trip? The most interesting and also most frightening thing that ever happened to me was hitting a bottlenose dolphin with my paddle and having him/her blow some slimy air on me. He/she was feeding along the bank of Delegal Creek and I was paddling close to the right bank. The water is murky there because of the very high tidal fluctuations and we were both surprised by the contact. How many Paddle Florida trips have you gone on and to where? I have been on two Paddle Florida trips. My first was The Keys Challenge this past January with my Montana daughter, Emily. 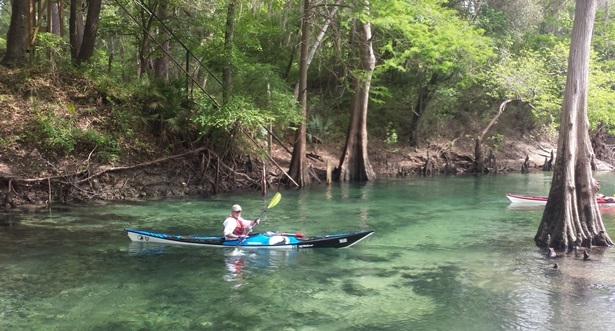 The second was the Suwannee River Paddling Festival in April 2015. Both were amazing as far as the people I met and the quality of the organization. The nighttime entertainment was world class. What keeps you coming back? I will keep going to PF trips in the future because these trips are well organized by caring people and the value received far surpasses what we pay for the trip. And you meet all types of people from all walks of life--all with the same passion--PADDLING! And the food is outstanding and plentiful. I am planning to redo the Keys Challenge in January and will do the Calusa Blue Water Trail in March and of course the Suwannee River Paddling Festival in April next year. These trips are addicting! Can you describe a Paddle Florida trip highlight? My best highlight from a trip came on the PF Keys Challenge. Emily, with limited kayak experience, and I were on the final leg of the trip off of Smather Beach, Key West. The water was roiling, the wind was howling and we had to deal with clapotis. Emily asked me if I was scared. I lied and answered "no,” yelling above the howling wind, "keep a paddle in the water and you will be fine!" I was somewhat worried because these were not beginner conditions. She made it just fine while believing my white lie; I really was a bit nervous. Once we landed safely she confessed that she had shed a few "tears of fear.” It was a precious moment! What advice do you have for folks considering a Paddle Florida trip? Do your homework. Get some lessons on rescue and self-rescue. Get some basic paddling skills. These are not really guided trips. They are supported trips. This is YOUR trip and PF is there to assist you and not baby sit you. Pick a group of like-minded and similarly skilled paddlers and stick together and watch over each other. You will make lifelong friends and be much safer than a solo paddler. Be ready to have the time of your life and to make everlasting memories. Be ready to exceed your limitations especially on something as challenging as the 7-day Keys trip.